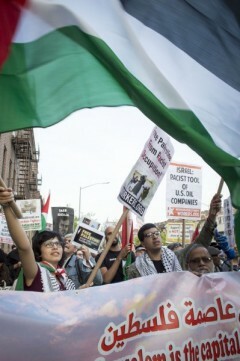 Bay Ridge rallies for #Nakba70, Great Return March and Jerusalem | Fight Back! New York, NY - Over 200 people gathered in Bay Ridge, Brooklyn for a press conference, rally and march, May 14, in response to moving the U.S. embassy to Jerusalem, the historical capital of Palestine. It also marked 70 years since the Nakba, or the catastrophe, where Palestinians were driven from their homes. The protest stood in solidarity with the Great Return March, and took place right after the massacre of Palestinian protesters in Gaza. After the press conference, the crowd rallied and then marched around the neighborhood. Protesters led chants and waved Palestinian flags, receiving attention from residents in the area. The action was organized by NY4Palestine and was a lead-up event to Nakba Day 2018: Great Return March protest set for Friday May 18 at 3 p.m. in Times Square. For more details about that action, visit the Facebook event page here.